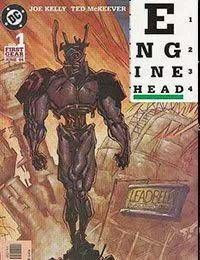 A thrilling miniseries by Joe Kelly &amp; Ted McKeever melds six heroes into one machine- based super-hero: Enginehead! The action goes down in Irontown, as Enginehead is created from a handful of DC heroes, Professor Emil Hamilton, Automan, Rosie the Riveter, among them. But what noble purpose will Enginehead serve? And how will this mechanical beast interact with the rest of the DCU?